Portland cement is widely used building material in the construction industry. As per ASTM, Portland cement is five types. These types are based on their rate of hydration and sulfate resistant properties. Type I: This is the general purpose cement. Normally this type of cement is used for general construction purposes such as bridge, building and precast construction. Type II: Moderate sulfate resisting cement. This type of cement used where there is a possibility of sulfate attack on concrete. Such as substructure. Type I and Type II almost same based on their properties. Type III: This type of cement is high early strength cement and useful during cold weather concreting where quick strength gain is a factor. This Type produces more heat than type I. Type IV: Low heat of hydration. The name of this type of cement clears that it produces less heat during the hydration process thus useful for hot weather concreting. This type of cement is also useful for producing a large quantity of concrete. Type V: High sulfate resistance cement. This type of cement is used where there is a possibility to contact high sulfate with concrete. The rate of hydration of this type of cement is slower than Type I. These types of portland cement are produced by controlling the percentage of constituents of cement. I will discuss the constituents of various types of cement someday on this blog. There are also other three types of cement which are produced by mixing air entraining agent with a particular type of cement. Such as Type IA, Type IIA, and Type IIIA. You may like to read: Common problems of concreting and how to avoid them. Very informative blog for the students..!!! You have written very well and explained in a simple way. 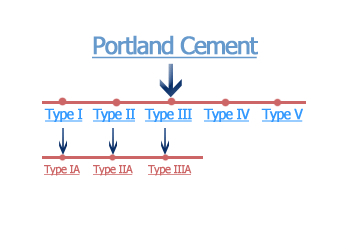 It is very important and basic topic on Portland cement and its types based on the hydration and resistant properties .